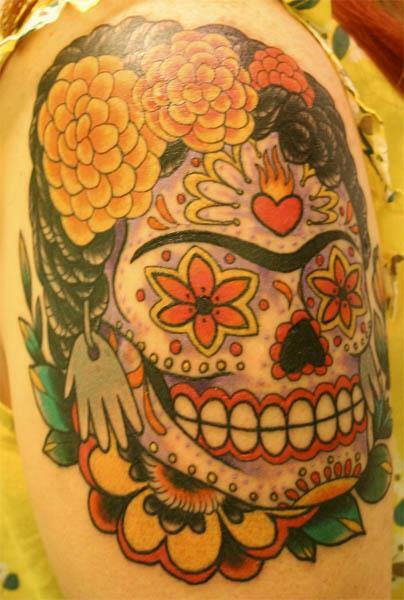 A sugar skull tattoo based on the Mexican painter Frida Kahlo. Frida Kahlo as a sugar skull is a very cool tattoo idea since her paintings were usually very vibrant and influenced by her Mexican heritage. Sugar skulls also tend to be very vibrant and are integral to the Mexican holiday Día de los Muertos. This sugar skull is instantly recognizable as Frida because of the way she always portrayed her eyebrows in her self portraits, as well as her hair style.